This week the Parliamentary Commissioner for the Environment released a report on the status and management of the longfin eel. 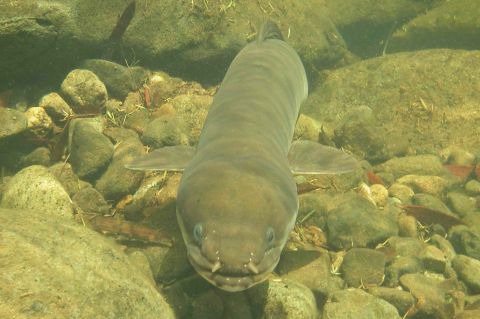 It was entitled “On a pathway to extinction?” The report found that the management of longfin eels by New Zealand government agencies was inadequate and failing. It further recommended the cessation of commercial fishing of longfin eels. A longfin eel, in a stream near Thames. This female hasn’t bred yet, and she will do so only once, after swimming to somewhere between Fiji and New Caledonia. Photo (c) Alton Perrie. Longfin eels (Anguilla dieffenbachii; tuna is Maori for eel) are amazing animals. They breed only once and then die. The adults found in New Zealand’s waterways have yet to breed. When mature, which may take 80 years, they swim to somewhere between Fiji and New Caledonia to find a mate. The prospect of finding a mate in a far-flung ocean presumably becomes less likely as numbers decline because of human impacts. After breeding, the adults die. The young larvae then drift back to New Zealand, and make their way upriver. The amount of suitable habitat for eels in New Zealand is now much decreased. The Commissioner highlighted this unusual lifecycle as complicating the management of eels. The Department of Conservation rates the threat status of longfin eel as “At Risk/Declining”, while the Ministry for Primary Industries allows the annual commercial harvest of more than 100 tonnes of longfin eel. The inability to reconcile these two facts is at least partially behind the Commissioner’s call to stop the commercial fishing of longfin eels. Earlier this year, Te Papa’s NatureSpace hosted the Travelling Tuna Tapestry project. The aim of this project was to inspire children to be interested in the conservation of the longfin eel. The tapestry grew during its travels around New Zealand as children contributed panels; one panel came from visitors to NatureSpace. A Department of Conservation site about the Travelling Tuna Tapestry. Many New Zealanders will be concerned that an endemic New Zealand species is effectively being managed to extinction. According to the commissioner, “Longfin eels need urgent help from the agencies that are responsible for their management and protection.” How will those agencies respond? Will they do enough to get the longfin eel off its pathway to extinction?